Thursday, July 9, 1914: Nothing doing. Since Grandma didn’t write much, I’m going to go off on a tangent. I was surprised to discover that some vegetables were marketed using a method similar to modern CSAs (community support agriculture) a hundred years ago. H.B. Fullerton, of Long Island, has developed a package which he calls the home hamper. This is filled with a seasonable variety of vegetables and expressed directly to the consumer at stated times as may be agreed on. This gives the customers the variety of vegetables they may desire and enables them to obtain them fresh. A cut of this hamper is shown in Fig. 58. A certain priced hamper is usually agreed on for the season or for the year. Posted on July 9, 2014 July 9, 2014 by SherylPosted in Farming and GardeningTagged 1914, family history, genealogy. Grandma is in quite the writing slump. I wonder what’s up with her. Things will pick up . . . I promise. I wasn’t familiar with CSA….? It’s fairly popular here. It’s where farmers sell shares of their vegetable/fruit production for the year–and people who buy a share get a box of produce each week. Everything old is new again! This is so interesting–I thought the CSAs were very 21st-century! I also wasn’t expecting it. I was really surprised to see this in the old book. I work at a CSA and would have been very happy to receive this as my week’s bounty!!! It sounds like fun to work at a CSA. Yes it is…especially when we bring home the fruits of our labor!!! Looks a very fine hamper. There really is nothing new……people here are often surprised that I order groceries online but for me it’s just much the same as my grandmother used to do; she ordered everything by phone. And all her orders were delivered to her home. When my grandfather had his store, he always employed a delivery boy to deliver customers’ orders. Interesting. . . I never really thought before about the long tradition of food delivery. In some ways it’s just the means of ordering that has changed across the years. You’re probably right and we’ll probably get to that stage before we know it–though I’m not sure if I’m ready for it. Interesting how long that idea has been around. We signed up for a CSA for the first time this year. Needless to say, we are ‘eating our greens’ every day. It sounds like you are eating lots of healthy food. I would order that hamper. My CSA delivered three heads of cabbage in one week, which was not quite the variety I had in mind. A body can take only so much cabbage, y’know? What did you do with it all? Hopefully you’ll get more variety as the season progresses. They knew what they were doing in the old days huh? They did. . . It’s interesting how some old ideas have again become popular. That’s very interesting. I bet his idea was successful too. I also bet that he was successful. 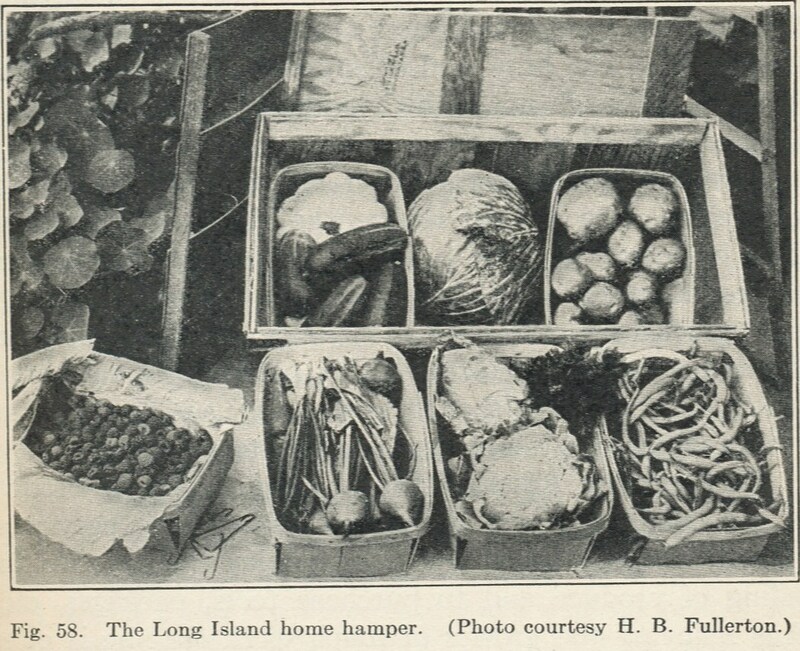 There probably were lots of people who appreciated fresh vegetables in Long Island. I wonder if he also distributed them in New York City. Great looking hamper! Have always been a bit intimidated by CSA’s because I wasn’t sure I could handle all those veggies. I haven’t tried it yet either. I guess you just have to be okay with occasionally throwing out excess produce. Hamper is a new concept for me, the small town city girl. We have tried to grow veggies here high on a foothill, but the bunnies have our number. Thank you for sharing, Sheryl. I currently buy a lot of things at a farmer’s market, but I should try using a CSA. I could do with this delivery system myself.